Let’s say that you have a job that you love. Your boss is understanding and supportive. You find the work challenging and exciting. You even like (most of) your coworkers. But your 3-hour daily schlep into the office? Not so much. Commuting can kill any good feelings you have about your job. After all, if you have to battle incessant traffic to get into work, arriving late, irritated, and sweaty into the office, you’re bound to grow resentful of the amount of time it takes to get to your desk. But having work flexibility (in the form of being able to work remotely or even having a flexible schedule) can combat those feelings of frustration that come with commuting. 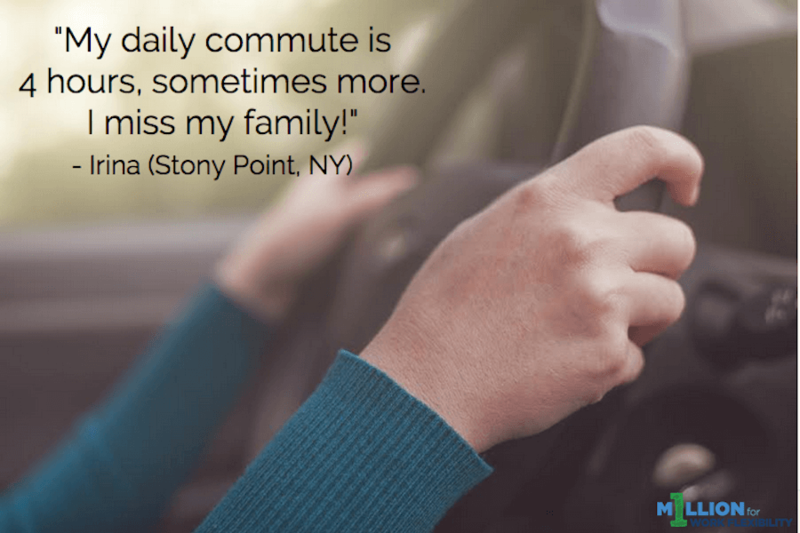 Straight from our 1 Million for Work Flexibility community, here’s why we want flexibility when it comes to commuting. To be a better worker. Let’s face it: Wouldn’t you be a happier person if you didn’t have to squish yourself onto a train each morning with 1,000 of your closest commuters? Starting your day on the right foot (i.e. not having to commute) can set the tone for the entire day, putting you in a better mood and optimizing you for your day at your (home) office. Sure, there are people who don’t like to commute. And then there are others, who for one reason or another, simply cannot commute into an office. For those facing physical or emotional issues, eliminating the commute from their day means that they have more options to choose from when it comes to the companies that they can work for, not just the brick-and-mortar ones that are closest to their home. Because commuting is too time-consuming. At the onset, a 45-minute commute to the office didn’t sound too terrible. But calculate it as an hour and a half out of your day spent doing nothing more than getting to and from work (and that’s on a good day when mass transit is running on time), and it can quickly add up. Many telecommuters will start their workday earlier (and therefore be more productive) if they don’t have to spend their time idling in traffic. Because commuting is bad for our health. Unless you’re skipping to work, singing a tune, and breathing in the fresh fall air, commuting is anything but relaxing. In fact, it can be downright bad for your health. Now imagine being able to sleep in a little longer each day, start your day off with no commuting-related stress, and feeling less tired? That’s the way to work—and it’s achievable through work flexibility. Because eliminating a commute means eliminating excuses. When you think about it, having to commute into work can make or break your work day. If your car just won’t start, you have to find alternative transportation—or take a day off from work, from which you may or may not get paid. Commuting can be a deterrent to work, but being able to have flex means that you can work on your terms. Whether you’re stuck in traffic, waiting for your late train to pull into the station, or standing in the rain while your fellow commuters try to cram themselves onto an already-crowded bus, commuting isn’t all it’s cracked up to be. Work flexibility removes this component out of your workday so you can actually work when you need to—and on your terms. Do these reasons for needing work flexibility resonate with you? Join 1 Million for Work Flexibility and share your “why”.